You know, I thought I was done. It had taken a good year’s worth of work to put together an Easter cantata (which isn’t ready to upload yet, btw, but will be soon), and I had dotted the last quarter note and added the final barline. I really thought I was done. Shows what I know. This song started singing at me, and I knew there was one more. (In a way, it was kinda like deciding I was done having kids and realizing there was another one waiting. 🙂 ) So I started scribbling, and “A Place In His Arms” was the result. The story of how Jesus blessed the little children they brought to Him is one that I especially loved as a child. I took a bit of delight in the idea that the grownups thought the kids had no business taking the Savior’s time, and had to learn otherwise. As an adult, the story has taken on a deeper (and kinder) meaning as I’ve learned some beautiful lessons from my own kids and the children I’m privileged to work with in Primary. I’m very grateful that the Savior taught us to value our children, and to be humble and teachable as they are. As real as the incidents in the Savior’s life were, they all seem to serve as parables as well. 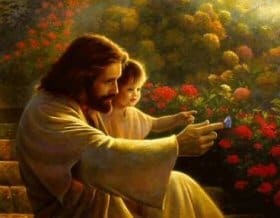 Jesus took the little children in His arms and blessed them… one by one… individually… giving me the assurance that there’s also a place in His arms for me. I’m always grateful when a song comes this quickly–even if it means I’m not really done when I think I am. As a side note, the children’s version of this song was awarded a “Grand Prize” in the annual Church music submission this year. I seriously considered calling the music office to ask if they’d made a mistake–it’s so very simple and not at all what I assumed a grand prize-winner would look like. Shows what I know.